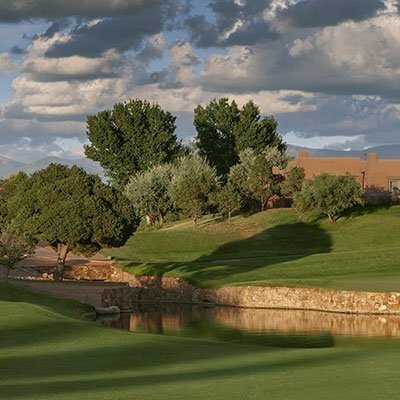 The Club at Las Campanas, located just nine miles from downtown Santa Fe, has garnered a reputation for being a premier club featuring world-class facilities. It was recognized as a Platinum Club of America for 2014-2018, and awarded an Audubon Certification in 2016. The Membership in The Club at Las Campanas provides a world of opportunities. 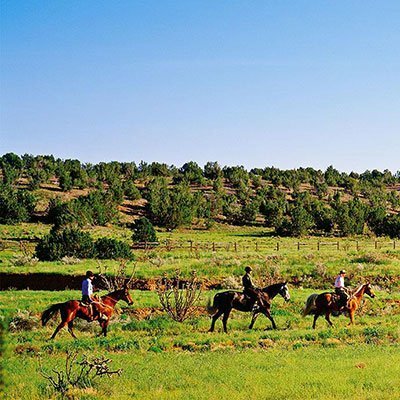 The only exclusive country club of its kind in New Mexico, The Club offers every imaginable activity and event. Excellence, integrity, respect, and environmental and social responsibility are cornerstones of the Club’s vision, and its members are a reflection of that vision, where diversity is embraced and celebrated. 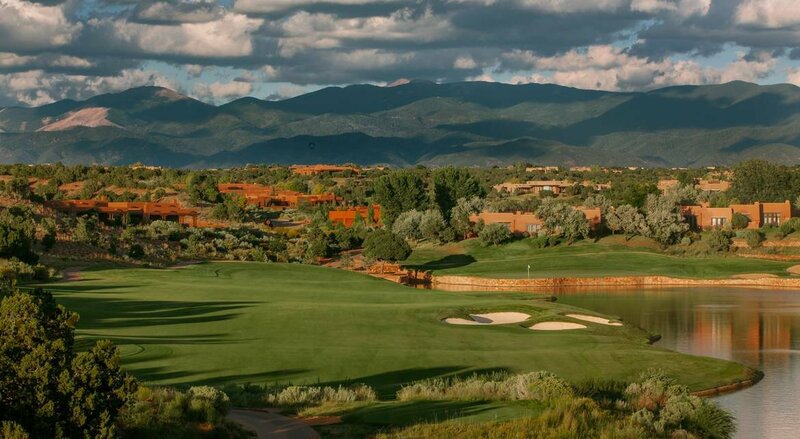 Las Campanas is the only master-planned luxury golf community in Santa Fe offering a life rich in shared pleasures. Golf rises to a new level on The Club at Las Campanas’ two Jack Nicklaus Signature Golf Courses. The Jack Nicklaus Signature Sunrise and Sunset golf courses, which have consistently earned high praise – accolades include the 2015-2016 Golf Digest Best in State Rankings for New Mexico with the Sunset Course ranked as #1 and the Sunrise Course ranked as #3. Members enjoy the strategic course design and thoughtful layout woven through the natural high desert beauty of northern New Mexico. Each of the award-winning, 18-hole courses offers an unparalleled golfing experience enhanced by the majestic mountain views. A round of golf at 7,000 feet at The Club at Las Campanas is a memory you will not experience anywhere else! 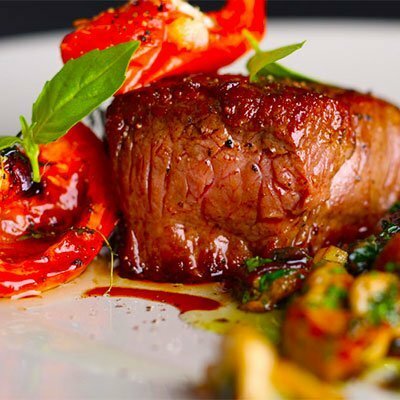 Dining Options to Suit Every Mood, The Club at Las Campanas offers contemporary, regional, and international cuisine presented in warm, sophisticated surroundings accompanied by friendly, attentive service. Members enjoy fine and casual dining amid the charming, distinctively Southwestern decor. The Hacienda Clubhouse is the heart of The Club at Las Campanas. Glorious views of the mountains and golf course can be seen from The Clubhouse, where the warm, hospitable staff is always on hand to answer requests. With its 46,000 square feet of space, the Clubhouse hosts parties, special events and private functions for friends and family that underscore the sense of community that’s central to Las Campanas. The Log Cabin, located next to the Equestrian Center, is less formal and is home to comfort food and local homestyle fare. Seasonal light casual outdoor dining is available at the Torreon Portal and the Spa Café, weather permitting. Year-around Wine Tasting Dinners, Cooking Classes, and special events are planned to bring members together. 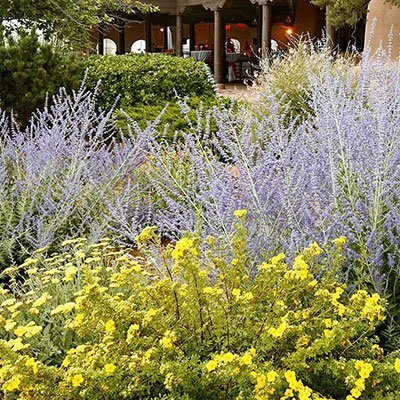 The Club brings Santa Fe’s rich culinary culture and local farm fresh foods to enlighten and enrich member’s culinary experience and knowledge. The Club at Las Campanas epitomizes Santa Fe’s reputation for health and wellness. The emphasis is on health, fitness and rejuvenation at the Spa & Tennis Center at The Club at Las Campanas. Work out at the well-appointed cardiovascular and strength training facility, schedule private yoga and Pilates training, enjoy group exercise classes or get into the swim of things at the indoor/outdoor pools. 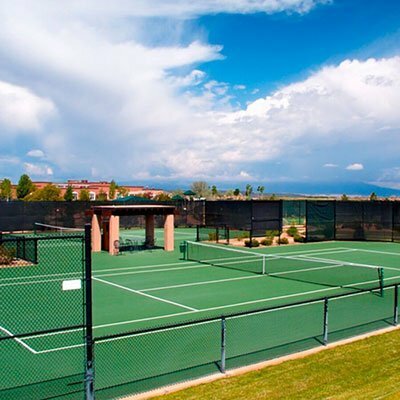 Tennis players will be delighted to find 7 synthetic clay courts, tournaments, social gatherings and lessons for all ages. The Las Campanas Spa offers a full range of services. When you’re ready to relax, pamper yourself with spa and body treatments or a visit to the steam room and sauna. Services include massage, facials, nail, and hair services. The Equestrian Center at The Club at Las Campanas sets a high standard. This world-class facility is thoughtfully designed to include an indoor riding hall, large outdoor jumping arena, all-purpose arena and regulation-size dressage court. A variety of horse breeds and riding disciplines are expertly accommodated, with professional staff providing instruction in English, Western, dressage, jumping and general horsemanship. Members who choose to board their horses at the Center will discover that they provide exceptional, individualized attention. The care and comfort of horses is their priority, and they do their utmost to enhance the sheer joy of riding for individuals of all ages and abilities.